On August 20th you turned 6 months. Wow, we've been together 1/2 year already! Leading up to your 6th month birthday, you surprised your Papa and I with all of your new skills and the blossoming of your little personality. You're becoming your own little person, and we're so proud of you. 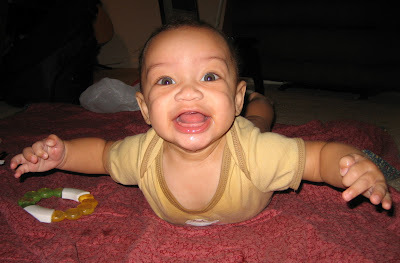 This past month you began crawling AND pulling yourself up into the standing position. You love this new found freedom to move because you HATE being confined, whether it's in someone's arms or in your car seat- especially in your car seat. You love exploring and getting around on your OWN, and you have the bumps and scratches to prove it. This makes me think that you'll be a very independent little boy. You have become very expressive of your feelings and your STRONG will. Momma knows that this trait is one that she passed along, and she prays that one day the Lord will cause that strong will to work for His purposes and not your own. You still aren't consistently sleeping through the night yet, although you recently surprised/teased us by giving us a couple of back-to-back full nights of sleep. Your night waking may be due to the fact that you're not the least bit interested in solid food yet (We will keep practicing though.) You love to "talk," and contrary to what everyone told Momma, you made the "MAMA" sound BEFORE the "DADA" sound! (On August 23rd, to be exact :) Momma's face must have shown like the face of Moses when you looked at her with your teary eyes and said "Mama" for the first time. I don't think you knew what you were saying (maybe you did ;), but it made my heart melt nonetheless. You're learning how to make all kinds of other new sounds as well. You're starting to get used to new people, and you're remembering the ones you already know quite well. You still cry alot when you're really tired, and you sleep best in your own bed, so Momma tries to stick around the house for nap time. More often than not, you take two good 2-hour naps a day, which gives Momma time to do things around the house. You've finally discovered your own feet and have a mild obsession with yours as well as other people's feet. You are Momma's favorite little person. You make me smile and laugh everyday. I can't imagine life without you. I love you, Silas!